Caleb Johnson, junior criminology and speech communication major; Marisa Saldaña, senior communications major; and Jonas Poggi, sophomore political science and speech communication major, discuss Proposition 6 in a debate held between the Young Republicans Club and debate team Tuesday in the Campus Center Ballroom. / photo by Jaren Cyrus. The debate team and Young Republicans presented a public debate on Tuesday evening regarding Proposition 6, which will decide if the current gas tax will be repealed. The gas tax in question coincides with the Road Repair and Accountability Act of 2017, which increased fuel taxes to raise $52.4 billion for repairs to California infrastructure. The lighthearted, informative debate had no winner or judge. Each group’s primary goal was to provide information about Proposition 6, so people can be more informed if they choose to vote on Nov. 6. Marisa Saldaña, senior communications major, began the debate with an opening statement for the Young Republicans. Saldaña’s partner was Caleb Johnson, junior criminology and speech communication major. Saldaña said that the government’s ability to implement the gas tax without consulting voters is a major problem. “I hate to take it back to the 1700s, but ‘No taxation without representation,’” Saldaña said. 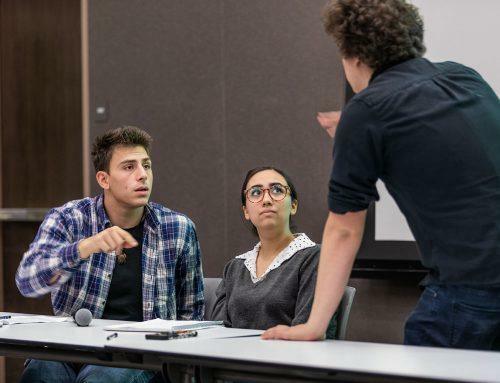 Jonas Poggi, sophomore political science and speech communication major, accompanied by junior English major Christian Nuñez, then made a statement for the debate team, arguing from a Democratic perspective. Poggi said that it was important to raise money to fix California’s poor infrastructure, noting that if money does not go into infrastructure now, the people will have to pay for it later. Poggi refuted Saldaña’s claim that the tax takes away people’s right to representation by stating that taxes cannot be raised without the vote of the state legislature, who are elected by citizens. Johnson refuted Poggi by stating that people, especially students like himself, cannot afford the higher prices of gas. Johnson said that he wants California’s infrastructure fixed, but believes that the tax should be repealed and rewritten to make it easier for people who cannot afford the prices. University President Devorah Lieberman said she attended the debate so she could learn both sides of the Proposition 6 argument and become a better voter. Lieberman noted the importance of being an informed voter. Poggi said this debate was the last in a series of community debates the team hosted. He said the goal of the series was to educate the community, especially during election season. “No matter what side you vote for, make sure you are informed when and if you do,” Poggi said.